SAP ABAP Tutorial – You can create Tree Report simple using RS_TREE_LIST_DISPLAY. 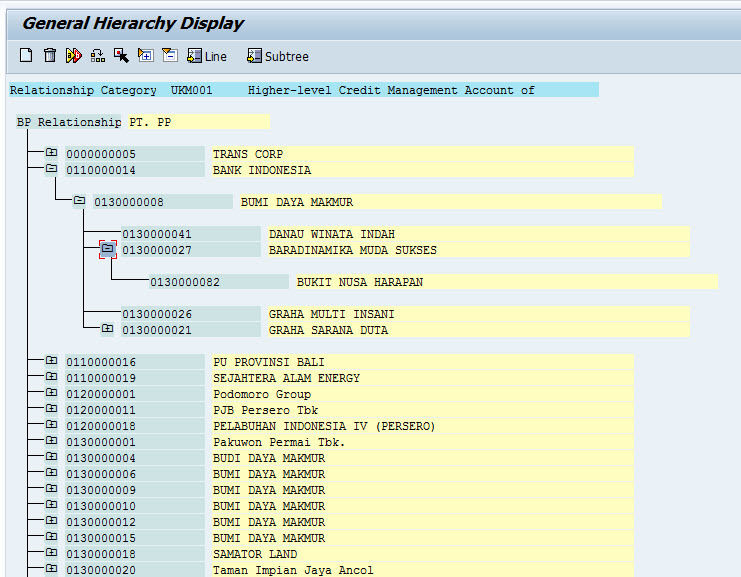 In this sample ABAP Code we have to create Business Partner Relationship Report. This report must build with Tree layout report, let’s start from getting data and put into an internal table, then build tree node by populating internal table which it have SNODETEXT type. Data declaration for additional node information DATA : t_node TYPE snodetext. *Internal table and wa decl for nodes DATA : it_node LIKE TABLE OF t_node INITIAL SIZE 0, wa_node LIKE t_node. DATA : t_node TYPE snodetext. Then create top level node using this code below. CLEAR : it_node, wa_node. wa_node-type = 'T'. wa_node-name = 'BP Relationships'. wa_node-tlevel = '01'. wa_node-nlength = '15'. wa_node-color = '4'. wa_node-text = 'DEMO BP'. wa_node-tlength ='20'. wa_node-tcolor = 3. APPEND wa_node TO it_node. CLEAR wa_node. You can see that code on WA_NODE structure and field, for top level node you can entered “T” for WA_NODE-TYPE, WA_NODE-TLEVEL is node level you can entered level for your node. you can change that code to your specific needs. You can see full source code below ( This is not full optimized ABAP Code just for sample, you can tune up or modify this code ). *&---------------------------------------------------------------------* *& Report ZTEST *&---------------------------------------------------------------------* REPORT zre_sd006_reportbp. TYPE-POOLS : fibs,stree. *Data declaration for additional node information DATA : t_node TYPE snodetext. *Internal table and wa decl for nodes DATA : it_node LIKE TABLE OF t_node INITIAL SIZE 0, wa_node LIKE t_node. DATA : lr_reltyp TYPE TABLE OF bus050_btr WITH HEADER LINE, lt_relat TYPE bub01_rel_admin_tab WITH HEADER LINE. SELECTION-SCREEN : BEGIN OF BLOCK b1 WITH FRAME. PARAMETERS : p_burel TYPE bu_reltyp OBLIGATORY DEFAULT 'UKM001' MATCHCODE OBJECT bu_reltyp, p_valid TYPE bu_datfix. SELECTION-SCREEN : END OF BLOCK b1. *initialization event INITIALIZATION. *Start of selection event START-OF-SELECTION. *Select the data for tree PERFORM fetch_data. *Build the hierarchy for tree PERFORM build_hierarchy. *Build Tree for display PERFORM build_tree. *&--------------------------------------------------------------* *& Form fetch_data *&--------------------------------------------------------------* * text *---------------------------------------------------------------* * --> p1 text * <-- p2 text *---------------------------------------------------------------* FORM fetch_data . REFRESH : lr_reltyp. lr_reltyp-sign = 'I'. lr_reltyp-option = 'EQ'. lr_reltyp-low = p_burel. lr_reltyp-high = ''. APPEND lr_reltyp. CALL FUNCTION 'BUB_BUPR_BUT050_LM_READ' EXPORTING i_xlm2 = 'X' i_xdb = 'X' i_xrf = '' i_xall = 'X' TABLES t_reltyp = lr_reltyp t_relations_ext = lt_relat. IF p_valid NE '00000000'. DELETE lt_relat WHERE date_to < p_valid. ENDIF. ENDFORM. " fetch_data *&----------------------------------------------------------------* *& Form build_hierarchy *&----------------------------------------------------------------* * text *----------------------------------------------------------------* * --> p1 text * <-- p2 text *----------------------------------------------------------------* FORM build_hierarchy . DATA : lv_addrn TYPE ad_addrnum, lv_name TYPE ad_name1. DATA : lv_partner1 TYPE bu_partner, lv_partner2 TYPE bu_partner, lv_prev1 TYPE bu_partner, lv_prev2 TYPE bu_partner. DATA : BEGIN OF li_header OCCURS 0, partner TYPE bu_partner, END OF li_header. DATA : lw_relat1 LIKE LINE OF lt_relat, lw_relat2 LIKE LINE OF lt_relat. DATA : lv_node1 TYPE numc2, lv_idx TYPE sy-tabix. DEFINE mc_node. wa_node-type = 'P'. wa_node-name = &1. wa_node-tlevel = &2. wa_node-nlength = &3. wa_node-color = &4. wa_node-text = &5. wa_node-tlength = &6. wa_node-tcolor = &7. APPEND wa_node TO it_node. CLEAR wa_node. END-OF-DEFINITION. *Building the nodes and hierarchy for tree CLEAR : it_node, wa_node. wa_node-type = 'T'. wa_node-name = 'BP Relationships'. wa_node-tlevel = '01'. wa_node-nlength = '15'. wa_node-color = '4'. wa_node-text = 'DEMO'. wa_node-tlength ='20'. wa_node-tcolor = 3. APPEND wa_node TO it_node. CLEAR wa_node. SORT lt_relat BY partner1. REFRESH : li_header. LOOP AT lt_relat. lv_partner1 = lt_relat-partner1. READ TABLE lt_relat WITH KEY partner2 = lv_partner1. IF sy-subrc NE 0. IF lv_prev1 NE lv_partner1. li_header-partner = lv_partner1. APPEND li_header. ENDIF. lv_prev1 = lv_partner1. ENDIF. ENDLOOP. LOOP AT li_header. SELECT SINGLE addrnumber INTO lv_addrn FROM but020 WHERE partner = li_header-partner. SELECT SINGLE name1 INTO lv_name FROM adrc WHERE addrnumber = lv_addrn. mc_node li_header '02' '20' '4' lv_name '60' 3. LOOP AT lt_relat. IF lt_relat-partner1 = li_header-partner. CLEAR : lv_idx. lv_node1 = '05'. SELECT SINGLE addrnumber INTO lv_addrn FROM but020 WHERE partner = lt_relat-partner2. SELECT SINGLE name1 INTO lv_name FROM adrc WHERE addrnumber = lv_addrn. mc_node lt_relat-partner2 '03' '20' '4' lv_name '60' 3. DO 20 TIMES. ADD 1 TO lv_idx. IF lv_idx = 1. LOOP AT lt_relat INTO lw_relat1 WHERE partner1 = lt_relat-partner2. SELECT SINGLE addrnumber INTO lv_addrn FROM but020 WHERE partner = lw_relat1-partner2. SELECT SINGLE name1 INTO lv_name FROM adrc WHERE addrnumber = lv_addrn. mc_node lw_relat1-partner2 '04' '20' '4' lv_name '60' 3. LOOP AT lt_relat INTO lw_relat2 WHERE partner1 = lw_relat1-partner2. SELECT SINGLE addrnumber INTO lv_addrn FROM but020 WHERE partner = lw_relat2-partner2. SELECT SINGLE name1 INTO lv_name FROM adrc WHERE addrnumber = lv_addrn. mc_node lw_relat2-partner2 '05' '20' '4' lv_name '60' 3. lv_partner2 = lw_relat2-partner2. ENDLOOP. ENDLOOP. ELSE. LOOP AT lt_relat INTO lw_relat1 WHERE partner1 = lv_partner2. ADD 1 TO lv_node1. "05" SELECT SINGLE addrnumber INTO lv_addrn FROM but020 WHERE partner = lw_relat1-partner2. SELECT SINGLE name1 INTO lv_name FROM adrc WHERE addrnumber = lv_addrn. mc_node lw_relat1-partner2 lv_node1 '20' '4' lv_name '60' 3. LOOP AT lt_relat INTO lw_relat2 WHERE partner1 = lw_relat1-partner2. ADD 1 TO lv_node1. "05" SELECT SINGLE addrnumber INTO lv_addrn FROM but020 WHERE partner = lw_relat2-partner2. SELECT SINGLE name1 INTO lv_name FROM adrc WHERE addrnumber = lv_addrn. mc_node lw_relat2-partner2 lv_node1 '20' '4' lv_name '60' 3. lv_partner2 = lw_relat2-partner2. ENDLOOP. ENDLOOP. ENDIF. ENDDO. ENDIF. ENDLOOP. ENDLOOP. ENDFORM. " build_hierarchy *&---------------------------------------------------------------* *& Form build_tree *&---------------------------------------------------------------* * text *----------------------------------------------------------------* * --> p1 text * <-- p2 text *----------------------------------------------------------------* FORM build_tree . *Fm for constructing the tree CALL FUNCTION 'RS_TREE_CONSTRUCT' TABLES nodetab = it_node. IF sy-subrc <> 0. * MESSAGE ID SY-MSGID TYPE SY-MSGTY NUMBER SY-MSGNO * WITH SY-MSGV1 SY-MSGV2 SY-MSGV3 SY-MSGV4. ENDIF. *FM for displaying the tree CALL FUNCTION 'RS_TREE_LIST_DISPLAY' EXPORTING callback_program = sy-repid callback_top_of_page = 'FM_TOP_OF_PAGE' check_duplicate_name = '1' color_of_node = '4' color_of_mark = '3' color_of_link = '1' color_of_match = '5' node_length = 30 text_length = 75 use_control = 'L'. ENDFORM. " build_tree FORM fm_top_of_page. DATA : lv_desc TYPE bu_bez50. SELECT SINGLE bez50 INTO lv_desc FROM tbz9a WHERE reltyp = p_burel AND spras = sy-langu. FORMAT COLOR COL_HEADING INTENSIFIED. WRITE: /01 'Relationship Category', 24 p_burel, 35 lv_desc. ENDFORM. lt_relat TYPE bub01_rel_admin_tab WITH HEADER LINE. DELETE lt_relat WHERE date_to < p_valid. lw_relat2 LIKE LINE OF lt_relat. READ TABLE lt_relat WITH KEY partner2 = lv_partner1. SELECT SINGLE addrnumber INTO lv_addrn FROM but020 WHERE partner = li_header-partner. SELECT SINGLE name1 INTO lv_name FROM adrc WHERE addrnumber = lv_addrn. mc_node li_header '02' '20' '4' lv_name '60' 3. SELECT SINGLE addrnumber INTO lv_addrn FROM but020 WHERE partner = lt_relat-partner2. mc_node lt_relat-partner2 '03' '20' '4' lv_name '60' 3. LOOP AT lt_relat INTO lw_relat1 WHERE partner1 = lt_relat-partner2. SELECT SINGLE addrnumber INTO lv_addrn FROM but020 WHERE partner = lw_relat1-partner2. mc_node lw_relat1-partner2 '04' '20' '4' lv_name '60' 3. LOOP AT lt_relat INTO lw_relat2 WHERE partner1 = lw_relat1-partner2. SELECT SINGLE addrnumber INTO lv_addrn FROM but020 WHERE partner = lw_relat2-partner2. mc_node lw_relat2-partner2 '05' '20' '4' lv_name '60' 3. LOOP AT lt_relat INTO lw_relat1 WHERE partner1 = lv_partner2. ADD 1 TO lv_node1. "05"
mc_node lw_relat1-partner2 lv_node1 '20' '4' lv_name '60' 3.
mc_node lw_relat2-partner2 lv_node1 '20' '4' lv_name '60' 3. DATA : lv_desc TYPE bu_bez50.